"General of Heaven 天公将军 (tiān gōng jiāng jūn)"
The leader and inciter of the yellow turban rebellion, Zhang Jiao became a hero to the those suffering under the corrupt and decaying Han Dynasty 汉朝. Due to a terrible famine that hit China at around 180 AD, the people suffered terribly and yet were further tormented by corrupt and greedy officials. It was then that Zhang Jiao met a strange old man in a cave which gave him 3 books, said to contain the ways of a mysterious art. After mastering the books, Zhang Jiao could control the wind, rain, and lightning and became a sorcerer. Despite having these powers, Zhang Jiao won the hearts of the people by providing aid and supplies to those in need. It was thus that tens of thousands rallied behind Zhang Jiao in his bid to overthrow the Han Dynasty. He never succeeded however, and was defeated by those who were loyal to dynasty, namely Liu Bei 刘备 and Cao Cao 曹操. Character ability 1: "Lightning Strike 雷击 (léi jī)"
Whenever you use or play a DODGE 闪, you can select another player to make a judgement. If the result is the suit of spades, you inflict 2 units of lightning damage to that player. 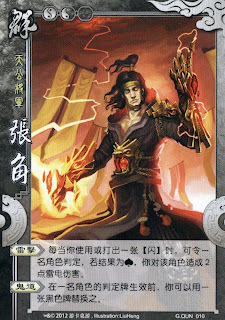 Character ability 2: "Dark Sorcery 鬼道 (gǔi dào)"
Before the judgement card of a player takes effect, you can interchange that judgement card with a black-suited card. The Ruler Ability is removed. Otherwise, Zhang Jiao is the same! In the story, there wasn't much mention of Zhang Jiao himself. From what is written, it is known that can he control the weather (like Storm from X-Men). Therefore "Thunder Strike" is a direct link. There is no mention of any form of deception or intervention such as "Dark Sorcery", however. “Dark Sorcery”, along with “Demonic Talent” (the ability of Sima Yi 司马懿), are the only abilities that alter judgement directly. In the story, it was said that the Mandate of Heaven of Han Dynasty is about to pass off, so Zhang Jiao was given mystical ciphers by an immortal to change the world. Zhang Jiao then used the ciphers to initiate the Yellow Turban Rebellion, signaling the beginning of the Three Kingdoms Era. As a result, Zhang Jiao can alter judgement(fate) with his cipher, while Sima Yi, the “fated” one to end the Three Kingdoms Era, can change the judgement with his talent.